CHICAGO—With songs both sultry and sublime, two gay Asian groups are joining forces to raise funds for LoveYourself Anglo. 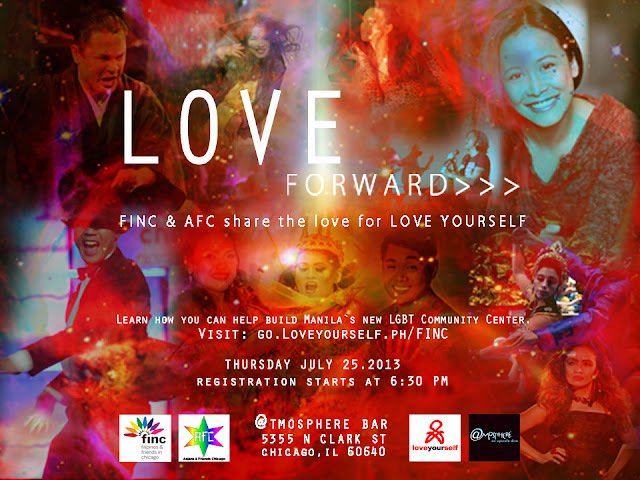 At an event entitled “Love Forward >>> FINC/AFC share the love for LoveYourself Anglo,” Filipinos and Friends in Chicago (FINC) and Asians and Friends Chicago (AFC) are hosting a cabaret evening of local performers on Thursday, July 25, 2013; 6:30 p.m. registration/cocktails, 7 p.m. showtime at @mosphere Bar, 5355 N. Clark in Chicago. Included in the roster of performers are lyric opera singer Rodell Rosel, playwright and singer Danny Bernardo, cabaret singer Madame X and jazz dancer and musical-theater actor Chip Payos. Other acts include Angel Abcede, Divine Aleonar, Marcus Ascesor, Randy Ballesteros, Christine Bunoan, Jovie Calma, Abe Commendador, FEDS, Joey Flores, Emjoy Gavino, Je Nepomuceno, Ula Rivers and Maila Witt. The two groups are pooling resources for the first time, working together to help LoveYourself Inc. in building a second community center in the heart of Metro Manila to cater to the needs of the LGBT community.